While growing up in Vincennes, Ind., Carolyn WarmSun recalls her parents stressing the importance of education. She set college as a goal. However, her family’s limited financial resources meant WarmSun would have to develop a plan on her own. She heard about Southern Illinois University through a friend. The university offered monetary support enabling her to enroll and WarmSun received a student worker position on campus. The vibrant 1968 psychology graduate was moved by a DVD she received from her alma mater about a decade ago. The DVD promoted SIU’s efforts to provide financial assistance for students who demonstrate need. A fine artist and painter, WarmSun develops images alone in her Oakland, Calif.-based home studio. Now, she is creating brighter futures for students following in her footsteps. WarmSun and her husband, Larry Cooke, created The Carolyn Holloman WarmSun Scholarship by naming the SIU Foundation as a beneficiary of their retirement assets. The scholarships will support financially needy students from WarmSun’s native rural southern Indiana in addition to rural southern Illinois. WarmSun aspires to help young people who are in the midst of similar circumstances that she encountered en route to SIU. WarmSun’s journey to a college education wasn’t easy. Personal issues led to WarmSun withdrawing from the university during her sophomore year. WarmSun’s father secured a $300 bank loan for her, and she left the Midwest for New York City. She worked at Chase Manhattan Bank during the day and attended New York University at night. Co-workers were particularly supportive. “New York was a thrilling experience in many respects,” she says. “I met some wonderful people who took me under their wing. I’ve been blessed to have individuals in my life who saw potential in me and were in my corner. The University once again provided financial assistance and WarmSun became a perennial Dean’s List student. She is particularly grateful for a roommate from Greece who introduced her to diverse students from all over the world; Earl Glosser, PhD of the Counseling Center; and Richard Ury, manager and mentor at WSIU-TV. Subsequent to attaining a bachelor’s degree in psychology from SIU, WarmSun, who also attained a master’s in social work at the University of Illinois, enjoyed a successful career in mental health. A career highlight was WarmSun establishing a women’s mental health services program for the state of Hawaii and being named an associate clinical professor of psychology by the University of Hawaii. She returned to the Mainland in 1979 and continued to work in mental health. In 1991, she became an organization development consultant for a major health care company. 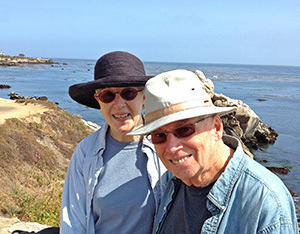 As she approached retirement, WarmSun coveted an avocation that she could be passionate about. She enrolled in water color classes at a local high school near her Oakland, CA, home, and intensified her learning upon retirement. WarmSun subsequently discovered a book in her favorite used bookstore that continues to motivate her to this day. “A real transformation occurred when I read Maxine Masterfield’s book, Painting the Spirit of Nature,” she says. “I saw how to paint the essence of nature.” In February 2010, WarmSun spent four days with Masterfield in Florida. The influence of WarmSun’s parents is also apparent. Her mother was a creative woman who enjoyed art and music. Her father had always told his daughter that he had Cherokee in his genetic background. He was an avid reader whose love of Native American lore also influenced her life and art. Others are noticing. She was invited to share art pieces for “Sacred Rhythms” at the Christ Church Cathedral in Lexington, Kentucky. WarmSun was also asked to present her work and conduct a presentation in February at the San Francisco Peace and Hope Fest at a gallery in the City. If you would like to see her work, go to www.warmsunart.com. While her work continues to be in demand, WarmSun plans on taking a brief break from her art studio in October to attend a high school class reunion and visit family in her hometown. At the same time, she and her husband plan to visit to SIU campus, which she hasn’t seen since 1972. If you are interested in learning more about supporting SIU through retirement plans or other gift planning options, please call Executive Director for Development Pat Moline at 618/453-4947 or visit our website at: www.siufgiving.org.